Whenever I eat noodles, I think of my paternal grandparents. They co-owned a mom-and-pop restaurant in Lahaina, Maui with silent partners. Their menu featured saimin, a dish local to the Islands. Growing up there, I learned how to slurp noodle soup, how to fold wontons, how to properly roll lumpia. I learned how to work hard. I learned family secrets between the rings of the bell hung high on the front door. As a former army brat and present-day wanderlust, saimin is precious to me. Born from Hawai‘i’s plantation era, the dish has remained a staple in modern cuisine. When the temperature dips and rain arrives, cravings for the soft, skinny wheat and egg noodles in hot dashi become the center of conversation alongside the weather. At my grandparents’ restaurant, we garnished our bowls with char sui, fishcake, egg, and green onions. But nothing can close the distance of the Pacific and everything else between me and my hometown like a steaming bowl of noodles. Since leaving in 1998, I have lived in Michigan, West Virginia, Pennsylvania, Honolulu for two gorgeous years, California, and Mississippi. Ramen and pho are not saimin, but most of the time they satisfy my craving and prove kinder to the wallet than round-trip flights to Hawai‘i. In 2018, when a dull pain began pulsing in my left abdomen, I told my primary care practitioner about its persistence at a routine checkup. Following blood work, my doctor called about the presence of tissue transglutaminase IgA, an antibody found and typically high in people with a gluten sensitivity. She quoted a standard of less than 0.9. Mine tested at 3.77. Suspecting celiac disease, she arranged tests to dig and—hopefully—eliminate, dig and—hopefully—eliminate. “This is terrible news,” I remember saying. I had eaten chicken noodle soup for breakfast and a too-creamy pasta for the previous night’s lackluster airport dinner. In the meantime, eat like you normally would, my doctor ordered. I devoured every noodle I could. In my earliest memory of my grandparents’ restaurant, I notice the color palette: red, black, and white. At the beginning of the U-shaped bar, plants and a cardboard stand for donated quarters separate the space where customers eat and ‘ohana sit while visiting. My brother and I struggle with plastic chopsticks. My grandpa, between boiling noodles and ladling broth, hands us wooden ones with rubber bands twisted around the tops so they snap together after we pull them apart. We catch noodles, bring them to our mouths. He beams, watching. Eventually, our muscles remember. We uncoil the genius design, swap wood for plastic. Despite fumbling with eating utensils, everything else—the framed photographs of family and Hawai‘i celebrities grinning with shakas, the signed dollar bills adorning the walls—feels like home. I, floating daughter of a brown Maui-born father and a white Midwestern mother, sense myself ground. My heartstrings anchor to the towel-covered prep station and tin foil-lined walls bordering the stove, the clear plastic containers with tiny spoons for hot mustard, the backless stools my grandfather pushes together for siestas. I spent the best moments of my childhood in that restaurant. Between fifth and sixth grade, my family moved to Lahaina after stints in Missouri, Germany, and Oklahoma. During breaks, I worked at my grandparents’ with my cousin for tip money, which bought candy, clothes, fair tickets, and music. After school, my brother and I walked two blocks to help until our mother or father retrieved us. 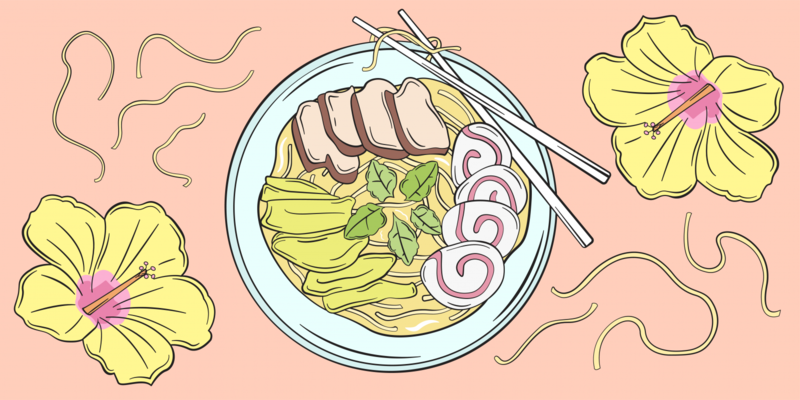 My grandmother laughed—and sometimes grimaced—at how I never tired of saimin. I inhaled smalls and mediums but wanted larges. Sometimes I snuck extra noodles under Napa cabbage and carrots. When hunger panged her, she asked me to cross the parking lot to buy her French fries or a sundae with extra peanuts, putting the exact change in my palm. Not only did she teach me how to push through the lunch, dinner, and late-night rushes, but she also taught me how to treat myself during quiet moments. After my parents’ divorce finalized, my mother moved us to Michigan. I was fifteen and would attend prom, earn my driver’s license, graduate high school, smoke cigarettes, and complete over a year of college before returning. The restaurant remained the same while everything around it transformed. My grandfather dreamed of offering local families an affordable place to dine. A whole meal for under twenty dollars, he repeated. Over nearly two decades, their saimin prices barely rose, but their rent climbed until keeping the business suddenly no longer made sense. Shortly after shuttering the doors, my grandpa passed away. During my transvaginal ultrasound, the nurse said everything looked healthy, and the doctor’s report echoed that. I scheduled my last test, an upper endoscopy, after our trip to Maui, where I gorged on noodles. Almost every night, I ordered saimin. If the bartender seemed uncool with my keiki saimin takeout after pupus and bourbon, we said a hungry child craved some back at the hotel. One afternoon, I waited for our to-go food at a restaurant my auntie recommended. Across the street, a crowd had formed outside the space my grandparents once rented. I contemplated lingering in the viral line just to stand on the tile we shared for so long, but I didn’t want that to dent my memories. I like my wun tun min hot, and I had to deliver crispy gau gee mein to the matriarch. When my father cooks saimin for family and close friends, homesickness bubbles through me from my crown to my toes. I hunger for noodles, for the spot next to my grandmother at the kitchen table with a clear view of her orchids, for the gallery walls filled with my grandfather’s immaculate smile, for Maui’s mythic and soul-nourishing beauty. Saimin ingredients are readily available in Hawai‘i grocery stores. My family keeps the silver bag of stock rolled and clipped in the freezer. Grandma, between blows on her soup, insists no one makes it like grandpa. It’s true. My dad and a couple places come close: a beloved local chain, a family-owned stand on Kaua‘i. Because saimin has remained widely in the Islands, nostalgia-evoking scents rarely creep into my path in Mississippi. My longing connects obliquely through the sight of lipstick-red char sui, a bubbling omelet, energy-zapping summer afternoons, bonsai, winter rain, scraps of bell, holiday tunes. If I bottled the scent of working in my grandparents’ restaurant, it would include notes of plumeria, grandma’s pressed powder, grandpa’s aftershave, sunlight, the sanitizer that dried and fissured my hands, savory fish broth and beef stick marinade, the blood-smell of coins swimming at the bottom of the tip pool, bamboo. To celebrate our marriage, my husband and I organized an aloha hour for close family. My grandmother, with complete menu freedom, ordered keiki saimin. When her bowl, garnished with broccoli florets, arrived, she tested the broth. “So salty,” she said, shaking her head. We laughed, collectively wondering when she stopped loving sodium. I realized it doesn’t matter how perfect the broth is. It will never be grandpa’s, and it can never be. Before my endoscopy, medical professionals said for the third time that I likely had celiac disease. They prescribed a gluten-free diet after the procedure, even though my prize for the growling belly and tender throat was a bowl of noodles on the way home. Against everyone’s suggestion, I slurped miso ramen because I needed to say goodbye, to hold a little ceremony in my mind. Weeks later, the test results arrived in the mail. My biopsies had returned normal. I felt relief, but I couldn’t deny the dwindling stomach pains and clearer skin that came with giving up noodles. My doctor and nutritionist proposed remaining gluten-free. And I do, though for special occasions, I indulge in irreplaceable things, things I rather not live without: noodle soups to warm my insides and send me home.